commenced recently at Imam Bacchus ground. Charles scored 52 as Lance Roberts XI defeated Bumeshwar Ramkissoon XI by eight wickets. Ramkissoon XI managed 116 all out in 29.3 overs, batting first. 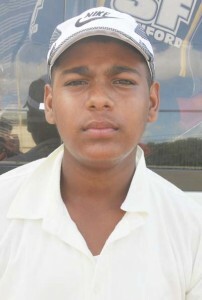 Ramkissoon scored 31 and Hamel Lam 20; Devendra Ramdahin claimed 3-10 and Sheldon Charles 2-8. Roberts XI responded with 117-2 in 21.5 overs with Charles leading the way. In another match Amos Sarwan XI overcame Badesh Parsotam XI by 22 runs. Sarwan XI got to 148-8 off their allotted 30 overs, taking first strike. Mark Fredericks made 17 and Romario Stephen 16. Saeed Hack and Parsotam snared two scalps each. Parsotam XI responded with 126-5 in 30 overs. Hack scored 27 and Azim Mohamed 22. Randy Raghubeer had 2-20. The final game will be played today at the said venue before the selectors name their team for the inter-county tournament.